We Pride Ourselves on the MORE. With design options to fit any style and budget, Dan's Overhead Doors & More works hard to meet your specific design and performance requirements. Choose from traditional raised panel, contemporary, and carriage house garage door styles constructed in steel, wood, composite, or aluminum. We offer free estimates on new residential overhead doors! Click the button below or call us at 319-626-3667 to set an appointment for one of our knowledgeable and experienced Sales Representatives to visit your home. We'll gladly help you find the product that is right for you and your home at the right price. These carriage house doors look like wood, but they are actually crafted of multiple layers of durable, low-maintenance steel and insulation topped with a wood grain textured composite overlay. Looking for inspiration? 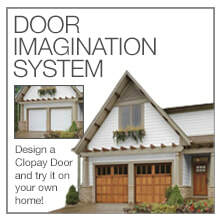 Click below to design your own garage or entry door using Clopay's revolutionary online design app! Dan's Doors & More offers the complete Clopay line of residential garage doors that will enhance the look of your home, making it an integral part of your home’s style. Our Clopay garage door product offerings are extensive, so whatever your needs may be, we have a door that will add beauty and value to your home that is second to none in durability and reliability. ​You can choose either wood or steel carriage style garage doors from Our Reserve™ or Coachman® Collections. Our Gallery™ Collection offers the carriage style garage door look at a more affordable price. For a more contemporary look, choose from the Avante™ Collection which combines contemporary aluminum and glass in sleek, modern designs. At Dan's Overhead Doors & More we are proud to offer Haas Doors. Their carefully crafted doors use locally sourced materials to create products to use in homes and businesses throughout North America and the world. You can select your favorite style from eight different product lines in a range of sizes, thicknesses, surface treatments, colors, windows and options.